I asked myself this very question about a year ago. I too liked the 7mm and wanted a rifle for deer, elk, and moose. I think the .284 Win in an excellent choice. Good barrel life, great 7mm bullets and ballistics, very manageable recoil, and we all know they're accurate out to 1000yards. What is there not to like for a long range hunter. I built a .284 Win on a short action Surgeon. Every component I used was carefully selected to be both accurate and light. It has a 1:9 #5 Kreiger finished at 25". The #5 is the smallest contour Kreiger will cut a 7mm stainless. It's in a McMillan A3, which is again a weight compromise between the A5 and a HTG. The AI mag sits in a Badger M5 bottom mettal. I can only fit four 284 cases in the five round (308) mag. The Leupold VX-3 is a 6.5-20X40 LR that weighs in at 15.5oz. It sports a Jewell HVR trigger. I can't provide a range report yet because it came in yesterday. I've turned down my Win brass to .313 for the .317 neck giving 2 thou clearance per side. Dave made my reamer with .090 freebore for mag length COAL. I'm trying some RL17, H4350, H4831SC with Nosler 140 & 160 Accubonds, 150 Ballistic Tips, and Hornady 162 A-max's. I'll let you know what combination it likes best, my COAL will be 2.88 in the AI mag. Hope this gives you a few ideas. Here are couple pics. RussT, I just read your comment/question and agree with you completely about shot placement. I'm an archer also and truly value a well placed shot. With a rifle more is not always better. Anyway, the free ballistic software Point Blank has a Taylor KO calculator. Basically what it does is takes you BC, bullet weight and fps to give you an efficiency chart for most big game animals based on distance. Example: my 160gr Accubond (.531 BC) going 2800 (estimated) is good for elk up to 300yards, from 400 to 700 it's marginal, and poor past 700. I wouldn't say it's a definitive tool, but it gives you a ball park. That is one sweet looking rifle! That is pretty much exactly how I would set up a long range hunter too. So how much does it weigh? And what percentage are those colors on the stock? All good information here! I hunt short range and long range, both being relative terms. I have killed Texas whitetail deer out to nearly 800 yards with a custom 7 WSM and 168 SMK bullets. All were complete pass through lung shots and the deer went less than 25 yards. I have shot a deer at around 200 yards that managed to run over 150 yards. The shot clipped the upper heart. 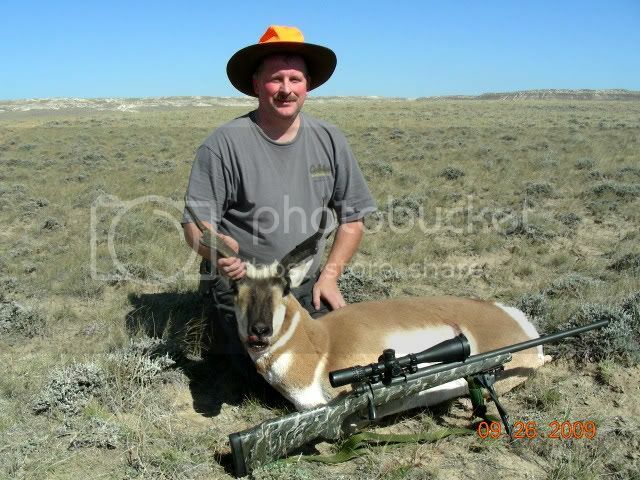 I have killed two deer with 338 Lapua 300 gr SMK at 767 yards and 1003 yards and both were drt. You need a good bullet that will expand at the velocity that the bullet will be going when it reaches the target. You will need good ballistic charts for your rifle load combination, good ranging and wind reading equipment, a good rest both front and rear, and some good practice prior to taking the shot. You also need a good scope and accurate rifle. It also helps to have a spotter/observer. I have muzzle brakes on my rifles to allow me to observe the shot. Wind is the most challenging component in Texas. It takes practice, practice, practice. Thank you for the remarks everybody. savageboy - I am very familiar with the 180 Berger VLD's. The thing with building a SHORT ACTION .284 is that boiler room gets restricted with longer bullets. Especially for me that is loading to mag length. I'm pretty sure that a Hornady 162 a-max will be the longest bullet I can shoot. If I can't get my velocities high enough with the a-max's I'll try a shorter(lighter) bullet. If the a-max's perform to my expectations I will definately try the 180's. The longer the bullet, the less case capacity, and therefor higher pressures (everything else being equal). Luckily, while I was building this rifle RL17 came out and has shown to increase velocity in some rifles while maintaining safe pressures. I am hoping that with RL17 I can get my velocities up around 2900-3000 with the 160-162gr bullets. Only time will tell. Sisu - It weighs 9.5lbs. Colors are 34%Olive, 33%Black, 33%Light tan. Rtheurer has a good point in things to consider when looking at long range choices. His thinking has been expanded by the folks at Hornady to include bullet diameter and weight. They don't give any credit for premium bullets so the results are probably conservative. The URL is http://www.hornady.com/ballistics/ and all you have to do is enter bullet weight, diameter and terminal velocity. BTW it looks like the 6.5 mm is hard to beat for good performance using the Hornady HITS methodology if you're trying for long range performance and modest recoil. That said, I think that would be an awesome rifle for long range. Personally, I would not build a 284 on a short action unless it was a single shot. You cannot seat the good bullets out far enough. The 180 Berger is what really makes the 284 sing at long range- I doubt you can load that bullet and use the magazine. To the original question, the 7mm Rem mag is a great long range caliber if it is properly chambered. The neck is a little short but if you are careful, you can work around it. The 284 will give better barrel life, but I don't know any hunters who have worn out a barrel on any thing less than a 30-378! The 30's hit harder and are hard to beat but have more recoil. You have to decide how much recoil you can stand and go from there! 6.5x47Lapua using 41gr H4350 behind 130Berger VLD at 855yds worked very well last week.